Civil blood is spilled where Sin goes free. Do with their death bury Yu Yevon’s strife. Whilst romantic video games are few and far between, the 10th installment of the Final Fantasy series stands out in my mind as one of the finest. Final Fantasy X, released in 2001 on the Playstation 2, is the story of a young lady and her journey to bring peace to a world in suffering, told from the perspective of the young man she falls in love with. So on one hand we have Tidus. He’s our playable character (you will notice how I did not say main character). He gets a lot of flak but I actually like him because I strongly identified with an overly-emotional rebellious teenager. He’s impulsive, he follows his feelings and will not accept an outcome unless he feels it makes sense. At times this makes him courageous (his battle command “Cheer” stacks with itself 5 times). When told not to enter Besaid temple he yells “Like I care!” and barges in. When Rikku tells him that summoner pilgrimages must stop, he questions her answer because (from his perspective) it doesn’t make sense. Tidus and Yuna are complementary opposites, both struggling to find their identity, but what I like so much about their relationship is how they influence each other. Their love is mutual and both Yuna and Tidus change drastically as characters, each trying to be more like the other. Early on it’s subtle. For example, on the walk through Kilika woods, Yuna declares that “I want him close to me”. While this goes way over Tidus’s head, it’s notable because Yuna so rarely talks about what she wants. Conversely, Tidus who only cared about going home, sees Yuna perform The Sending and realizes that his problems are pretty small in comparison to the countless people of Spira killed by a flying space whale on a daily basis. We also see them encourage each other. When Tidus is frustrated and wants to just scream, Yuna says “go for it!”. Tidus, meanwhile, is constantly encouraging Yuna to complete her pilgrimage. 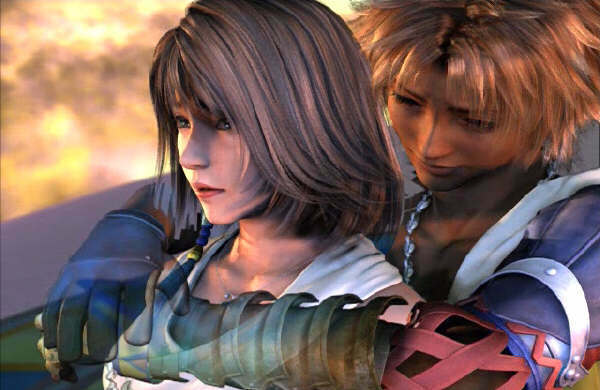 Of course, this is tragic because Tidus has no idea that Yuna is about to sacrifice her life at the end of the pilgrimage and because she doesn’t want to break his heart, she keeps this part a secret and simply smiles. Then Seymour comes into the picture and things get… complicated. Seymour proposes to Yuna. She obviously turns him down because what the hell. Then, half-way through the thunder plains, she suddenly changes her mind and Tidus starts to feel jealous. She claims it’s ‘for the good of all Spira’ but actually she’s on a secret mission to get rid of Seymour. Yuna didn’t want to bother others with the details of her plan, but as a result things go sideways and Yuna and Tidus are separated. So then we have the grand revelation: Tidus discovers that Yuna will die if she completes the pilgrimage. This shocks him because Tidus usually just acts according to how he feels. When he realizes he was encouraging Yuna to walk to her death, he has a crisis of faith in himself. He realizes how oblivious he was, he was so focused on himself that he didn’t even notice the immense weight of Yuna’s journey (Tidus: “Was I… the only one who didn’t know?”). The part that gets me every time in this scene is when he turns to Wakka and Lulu, asking why they hid this from him and they admit it was simply too hard for them to say. Meanwhile, when Yuna stands trial for Seymour’s death, she has her own crisis of faith. She discovers that the religious Maesters have gone against their own teachings and, worse yet, her death will not prevent Sin’s return; she had been lied to and is now branded a traitor. For the first time Yuna cannot place her faith in others and all of a sudden, she feels completely lost. Now we get a scene that needs no introduction as Tidus suggests that she abandon her journey. For a second it almost seems like she’s considering it, until she tearfully realizes that she can’t bring herself to let down so many people. What follows is a scene as beautiful as it is bittersweet. They’re having this moment because they know they don’t have a future together. Now Tidus and Yuna are at an impasse. Yuna remains steadfast in her will: even if it only brings ten years of happiness, that’s enough to for her to lay down her life. Tidus, meanwhile, refuses to accept this outcome and is convinced that he can find some other way of defeating Sin without her having to die. His determination inspires her. Her generosity inspires him. This is where things get interesting. At the end of her journey, Yuna discovers that she must sacrifice the life of a guardian just to create the next Sin. This crosses the line, and for the first time Yuna makes an impulsive decision. She refuses to go through with this, and stands her ground before her own namesake, Yunalesca. Yuna now has to believe in herself despite a world in panic mode after she broke the only known way of temporarily stopping Sin. Tidus, meanwhile, makes an ironic discovery. There is another option to defeat Sin but it comes at a price. He will have to forfeit his life (technically ‘become a dream again’ but same effect) and now suddenly he’s in Yuna’s place. This time, he’s the one who’s going to sacrifice himself for others to live and he tries to keep it a secret but Yuna isn’t as oblivious. She notices that he’s hiding something and calls him out at Bevelle temple (Yuna: “You’re a bad liar”). Still, she doesn’t question and he smiles like nothing’s wrong until the very end, where he admits to the whole group that after the dust settles, he will disappear. And finally, at the very end, their behaviors are reflections of each other: Yuna shakes her head and rushes towards Tidus, refusing to believe he will fade away while Tidus accepts his fate with a smile. I was never a huge fan of Tidus, but I loved Yuna and I loved the relationship they had. They were just wonderful, which is what made the ending so perfect and bittersweet. To this day, it’s the only game that has made me cry. I recently finished the HD remake, thinking I could keep it together this time since I knew what would happen. Nope. Still cried like a baby.